Let's face it, the temptation is great. BOGO Free, free shipping, 50% off, free gifts, (web)busters, 40% off and more on some of the hottest brands is enough to push a PJ to check herself into rehab. It's easy to go nuts on the internet, creating carts and buying products all willy nilly. Especially if that product is normally $15 - $20 and you can get it for under $10. Trust me, I understand. And while I'll admit that I do get a fair share of products for the free.99, I do continue to regularly purchase favorites from brands I love because I believe in supporting them. With that being said, I had to come up with a plan for myself this Black Friday thru Cyber Monday. I'm making a list, checking it twice, looking for the naughtiest deals that will keep my PayPal account nice (for budgeting reasons, I only use my PayPal account for hair related purchases, online or otherwise). I've set a limit for myself spending-wise, and will be using these 4 tips to get the most bang for my buck. 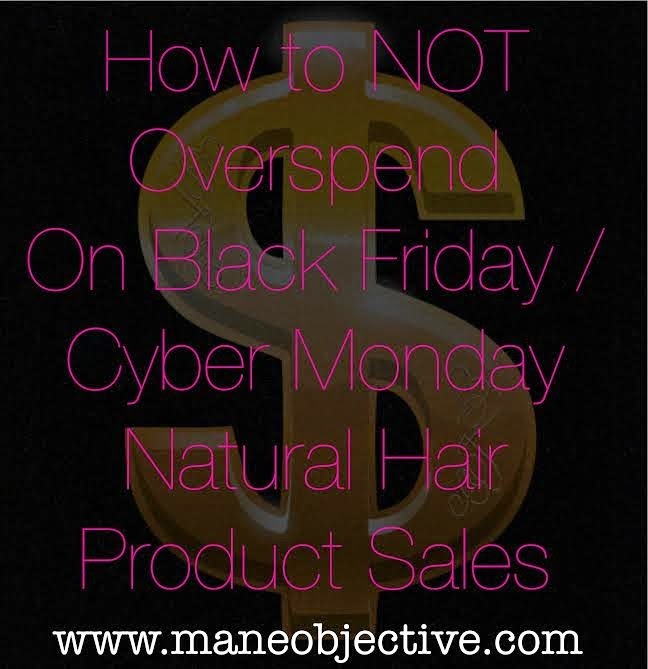 Here's how to not bankrupt yourself on hair products this Black Friday. Share with a Curlfriend! Because trust, I know firsthand that you can't pay your car note with conditioner. Tip #1: Set A Budget Limit & Stick To It. Whether it's $25 or $250, putting a ceiling on your spending is the first step to avoiding Black Friday disaster debt. If you have the means, move Black Friday/Small Business Saturday/Cyber Monday funds to one account specifically designated for those purchases, and use only the card associated with that account for purchases. If you can take that one step further and move everything BUT your spending limit amount to another account, do that. As I mentioned previously, I'm using my PayPal account for Black Friday hair purchases. For those that are curious, my spending limit is $80. For you nosy Rosies out there, I've spent $55.14 so far which leaves me $24.86 -- just enough to support one more brand. Whatever your limit is, stick to it. You can't pay your rent in refresher sprays! Now that you've set your spending limits, it's time to strategize. There are countless brands (my blog has over 60 and that's just scratching the surface), and alllllll types of sales going on starting yesterday through Monday. Running through brands with reckless abandon is the most sure fire way to blow the budget you so neatly crafted in tip #1. So break out the pen and paper (or note app) and determine how you're going to prioritize purchases. How you prioritize is up to you -- needs vs. wants, brands you trust vs. new brands, order of best sale or biggest discounts, cheapest vs. most expensive -- just get a clear cut idea of how you want to spend your money. Personally, I've prioritized my purchases by a three-way matrix of best sale x products I want x products I want to try. The two brands at the top of my list were Obia Natural Hair and Pura Body Naturals because of all the sales I've seen, 40% off and BOGO free respectively are two of the best deals I've seen. You guys really thought I was going to miss out on 40% off Curl Enchancing Custard? Plus, Pura Body Naturals let's you select a different item for your free purchase, making it super easy to nab two different things for the price of one. I say all this to say, prioritize your spending by what would make you happiest. I know what you're thinking. My favorite blogger swears by this product and I've always wanted to try it but it's too expensive at regular retail so I'll just buy a bunch since they're 35% off just in case I really like it I don't want to be stuck with just one or two and have to buy them for the rest of my life at regular price because what if it becomes a holy grail and then I run out of the little bit I have from the sale? I NEED TEN! I NEED TO BUY TEN! Stop. Right. There. Back away from the "submit order" button. Black Friday isn't a reason to treat the brand of your dreams like Costco or Sam's Club. There is no reason, absolutely none, to buy more than two of a product you've never tried before. Take it from me. Two is a reasonable compromise between not wasting your money, and regretting only buying one. There is always a chance that you'll hate the product, or something about it. And with small business purchases online, a refund is highly unlikely. It is truly a "buy at your own risk" scenario, regardless of how many people like it. Don't be the PJ that has 20 bottles of curl lotion in the product graveyard from a Black Friday binge gone bad. A bottle and 3/4 is easy to swap with a Curlfriend or in an online group. A store order's worth? Not so much. Save big purchase (3 or more) for products that are tried and true -- just don't go over budget. Before you start loading products in your cart with reckless abandon, take some time to consider what the sale is really asking you to do. Does the sale require you to spend $100 to save 20%? That's still $80 you have to spend, just to save $20. Do you only qualify for free shipping once you spend $60? What if you don't want $60 worth of stuff? Don't spend more than you intend to just to save $7 in shipping. My advice? Try to stick to sales with no minimums, or reasonable ones (under $50 minimum purchase for at least 30% off) that don't take you off your budget mark just to get free samples or shipping. That's it, Product Junkies! Those are my tips. Any other tips you'd like to share with fellow PJs and naturalistas?